Adam Joseph has your AccuWeather forecast as seen on Action News at 6 p.m. on April 18, 2019. PHILADELPHIA (WPVI) -- TONIGHT: Southerly winds overnight will continue to increase clouds, humidity, and keep temps from falling below 60. FRIDAY (GOOD FRIDAY/PASSOVER): We'll start the day off tomorrow very similar to today with lots of clouds and even some patchy fog or drizzle thanks to those increasing dewpoints. Much of the day tomorrow is much dirtier than today and overall we'll call it mostly cloudy. High temps will sit in the mid 70s. In the afternoon there could be some scattered t'storm activity, especially from I-95 on west, but the bulk of the action appears to wait until the late night hours after midnight and lasting into early Saturday morning. A FLASH FLOOD WATCH will go into effect Friday night into Saturday morning for all of SE PA and Mercer County in NJ. The primary concerns with this will be heavy rain that could cause some flash flooding. The other risk is for isolated damaging wind gusts as winds of 60 to 65 mph will be sitting not far above the surface on Friday night and could get brought down by a strong t'storm. Total rainfall looks to range from 1" to 2.5" across the region. The highest totals falling in the upslope regions of the northwest suburbs. SATURDAY: We will begin with pockets of heavy rain and even a t'storm for areas along and southeast of I-95. These should clear the coast by around noon with mostly cloudy skies for the afternoon. If we are lucky we will get a few breaks of sun late in the day. Highs in the low 70s. SUNDAY (EASTER): Should be dry for morning services and egg hunts under partly sunny skies. Then in the afternoon we'll see some showers and even a t'storm bubble up as the atmosphere turns very unstable as an upper level low is working through. High temps in the mid 60s. MONDAY: There are signs now that the low will stall another day with some lingering rain. This is up in the air, but needs watching. It's at least partly sunny and a tad warmer with a high of 73. 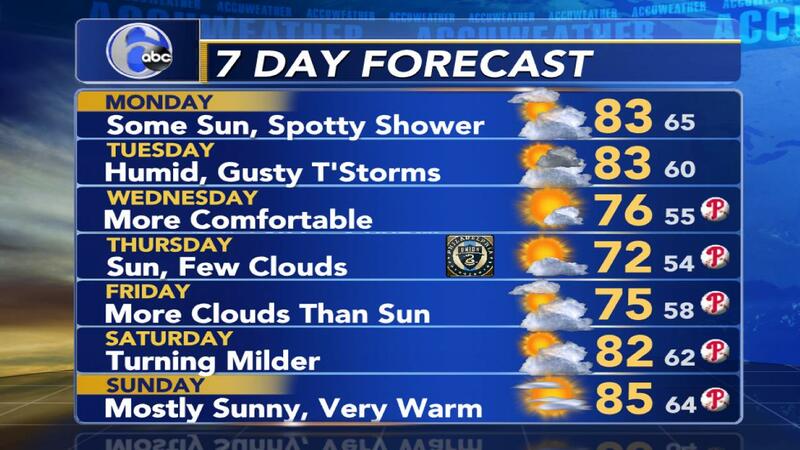 TUESDAY: Mostly sunny skies and a warm high of 79. WEDNESDAY: Clouds return along with cooler weather. A couple showers are possible. The high is 69.